If you thought Priyanka Chopra and Nick Jonas grooving to Tareefan in Miami was interesting, we have another treat for you. 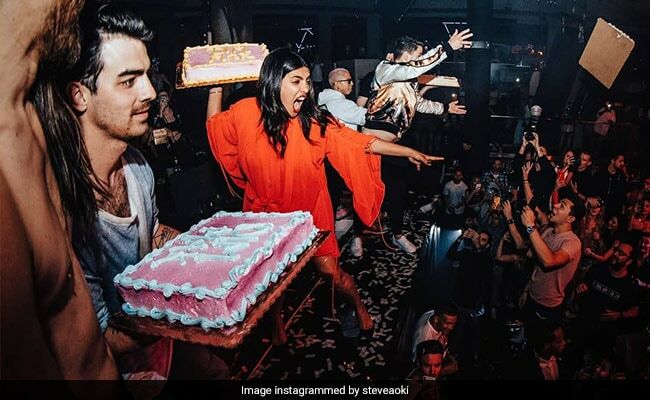 In case you are wondering what we are talking about, we are referring to the latest videos of Priyanka, Nick and Joe Jonas throwing cakes at a concert crowd in Miami, which are going crazy viral on the Internet. The video happens to be from American musician Steve Aoki's Miami concert. The video was originally shared by Steve on his Instagram profile and later curated by several fan clubs. In the video, fans can be seen gleaming with joy as Priyanka, Nick and Joe Jonas throw cakes on them. In a separate post, the musician gave us a sneak peek into the fun, frolic concert and wrote: "Cakes were flying last night but this time by new cake recruits Priyanka Chopra, Nick Jonas and Joe Jonas. We made a mess." Priyanka Chopra's recent Instagram entries totally corroborate to the fact that the Quantico actress had a blast in Miami. Here are some of the posts from her Miami diaries that will make you go green with envy. On the work front, Priyanka Chopra was last seen in the Hollywood film Isn't It Romantic?. Her next project is Shonali Bose's The Sky Is Pink, co-starring Farhan Akhtar and Zaira Wasim.